It's summertime, which means your thoughts turn to vacation. If you're new at a job, what are the rules about asking to take vacation time? In a lot of jobs, you earn vacation time, which means that you can't take a few days off until you've worked long enough to have earned time off. But some jobs grant you vacation on your first day of work. Can you take a vacation - and succeed on the new job - when you've only been there for a month? Here are several ways to look at and answer this question. If you have a trip planned before you start a job, the trip should come up during the negotiation phase. That is, if your sister in Alabama is getting married and you'll need 3 days off in July, don't wait until your first day in June to mention that you'll need time off. Instead, when you have received a job offer and before you've accepted it, you can ask if you can take those days off. In most cases, your new boss won't have a problem with such a request - although some may inform you that the leave is unpaid time. But, if your boss says no, you then have the choice of accepting the job and skipping the wedding or turning down the job and serving as her maid of honor. In this case, you have nothing specifically planned, but you'd like to take a summer vacation. Starting a new job doesn't mean you don't want to take a couple of days on the beach or go to visit grandma. Keep in mind that a lot of jobs have high learning curves and taking time off at the beginning can set you behind. You don't want your boss judging your long-term performance in a negative light because you took time off in the first couple months at work. With that in mind, it's still possible to take some time off. First, speak to your boss and acknowledge that you are new and you'll understand if it's not possible to take time off. Tell her that you'd like to take a reasonable amount of time off this summer. Expect the boss to give preference to everyone else in the office. It's not because you're not fabulous; it's just because you're new. If your boss says it's no problem, go ahead and take your vacation. If your boss seems hesitant, assure her that you understand and that you'll use your vacation time later in the year. Is that fair? Of course. You're new to the job, which means that the position has probably been vacant for some time and they have a backlog of work that needs to be done. This doesn't mean you won't ever get to use your vacation time, just that you need to do some work first. If you're a student, working to earn money for school or a car or whatever, and both you and your boss are clear that when school starts in the fall, you're out of there, it's a different situation. A lot of summer jobs are part-time, which means that you have a lot of free time anyway. You can ask for a week where you work Friday, Saturday, Sunday (which most people prefer not to work), and in exchange, not work the weekdays, allowing you to take a nice vacation - albeit undoubtedly unpaid. If your summer job is full time, getting time off is more difficult. People hire seasonal workers because they need people there to cover jobs. It is something you should also ask about during the hiring process. Keep in mind that the answer may be no. One reason employers hire summer help is to allow regular full-time employees to take vacation time. Competition for summer jobs is fierce, and you may lose out to someone who is willing to commit to the whole summer. ​Absolutely. If you've just been hired at an entry-level position, you're going to need to prove yourself. Asking for vacation right at the beginning won't help with your reputation. If you're the new director, how you approach vacation will set the tone for your department. You want your staff to take their vacations, so taking one yourself looks like a good leadership move. 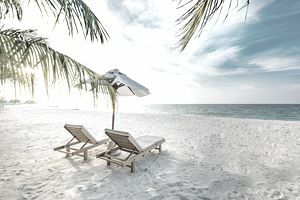 If you can't take a vacation in the first six months or more of a new job, it can be slightly bothersome, but it's one of the things that come with the new job territory. Feel happy that you're in a new place and make sure you're first on the list for planning next year's vacation. How Does Your Paid Time Off Compare With Other Employers? Why Should Your Company Offer a Floating Holiday?